If you can remember all the way back to my first blog post from almost a month ago, pre-Rome departure, I had quite an extensive list of things I wanted to accomplish while in Europe. A big one – possibly one of the most important – was checked off during this past week. My actual birthday on Wednesday, the 21st, was filled with many messages and people that made me realize how truly lucky I am to be here. It began for me at 3:30am, witnessing a papal audience at the Vatican. I had lunch in the Balduina neighborhood with a group of friends, and then of course afterwards there was gelato. Later in the night was the first intramural soccer game of the semester (GO LALAVANDA! We won, by the way). Afterwards everyone came out to celebrate my birthday; it put into perspective just how many amazing people I’ve met already during my time here. It would’ve been my favorite birthday just after all of that, but the celebration only escalated from there. 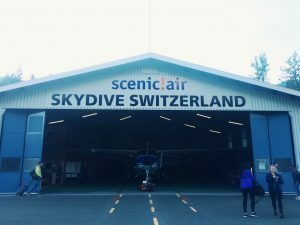 Skydive Switzerland is a tiny, box of an airport. It was just big enough to fit a small plane inside, which we saw roll out as soon as we walked up. “THAT IS SO SMALL. How will we all fit?” Even still, none of us had really grasped the fact that we were about to jump out of a plane. Our names were called by skydive instructors who suited us up and strapped us into our harnesses. We filled out paperwork that basically said if we died, they weren’t responsible. Still, it hadn’t hit me at all. It wasn’t long until they were guiding us toward the plane. There were about 6 of us diving at that time, all with individual tandem instructors. Fun fact: on average, each instruct or does about 8 skydives a day. We got in the plane and we were off. The houses and people of Switzerland got smaller and smaller as we went up and up. We floated around the mountain peaks of the Alps; it was stunning. That’s when I fully started to comprehend it all. We were about to free-fall out of a plane at 14,000 feet in the air, the Swiss Alps surrounding us. I literally couldn’t stop smiling. I don’t think any of us stopped smiling. We kept looking at each other in disbelief. “Wow, we are actually doing this.” It’s something I had been talking about for almost a year, and I was minutes away. Our instructors attached us to them a little tighter. “Now wherever you go, I go,” my instructor said. At one point, the skydive instructors laughed because they realized none of us were briefed before diving. They actually laughed!!! Then they said, “Here’s how it’s gonna go. Head back, feet tucked under, hands holding onto the harness. Good?” And that is literally the only instruction we were given before falling 14,000 feet. I watched, one by one, as my friends dove out before me. The instructors didn’t even give us any chance any chance at all to back out. Soon enough, to my horror, it was my turn. Still, I couldn’t wipe the smile from my face. I scooted all the way to the edge and dangled over, forced to gawk at the beautiful Alps in the widest view I’ve ever seen. Rocked back and forth, 1,2,3… We were out. I wish I could explain this moment. There is a split second in the air where everything is quiet, and you haven’t started falling at yet. It is a moment of hanging in suspense over the earth. A tiny moment of silence. Everything is calm. You can’t make a noise or breathe or do anything. You just hang there in the air… It is peaceful. And then, all at once, the wind is on your face and you are free falling, arms stretched out. Soaring at 120 mph, it is one of the most exhilarating feelings in the world. It is one of the best things that a person can feel. For 45 seconds of free fall, I had that indescribable feeling of happiness, probably from adrenaline. Physically, I couldn’t stop screaming or smiling. Not once did I think to myself, I could probably die. Or, hopefully the parachute works and everything is fine! I was too busy being blissfully, stupidly happy. The parachute deployed, thank god. I’m alive mom and dad!!!! 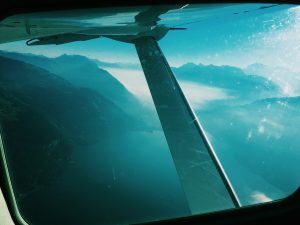 We floated around for a few minutes with the parachute above us, beholding all of the wonderful views of the Alps and of the bright-blue lakes of Interlaken. After landing, there were only hugs, high-fives, and laughs between my friends and I and the other divers. We spent the rest of the day wandering around Interlaken, still high off our adrenaline rush from earlier that day. It was easily the best birthday I’ve had. I genuinely can’t think of a better way to spend a 21st golden birthday. For everything, thank you Switzerland. I want thank both everyone at the JFRC and back home who sent me nice messages and made my day great. This past week has really put into perspective how lucky I am. Also special thanks to my parents, who probably had heart attacks watching the video of me jumping out of a plane. Love you! You can watch the video of my skydive on my Facebook! So, who’s going to jump with me next time?